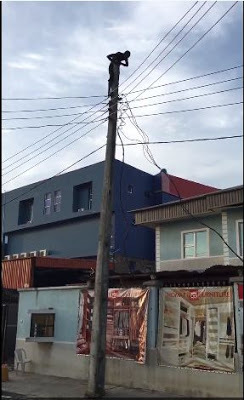 Mr Victor Adewunmi, the General Manager, Transmission Company of Nigeria (TCN), Benin region has cautioned Nigerians against erecting buildings within 50 meters precinct of high tension lines. Adewunmi said this in Benin on Tuesday while conducting newsmen round the area where a red conductor of the 330KV Benin/Egbin power line got detached. The News Agency of Nigeria (NAN) recalls that the power line got detached on Monday in Benin at about 6.p.m. Adewunmi, who was represented by the region’s Assistant General Manager, Technical Services, Mr John Madufor said the disaster was averted because the red conductor fell on the yellow conductor. He noted that if the conductor had fell on the ground, the people and houses within the precinct of the high tension would have been roasted. “What happened here is that the red phase of the conductor detached as a result of corrosion and rested on the yellow phase. “The saving grace was that it did not drop on the ground. If it had happened that way, what happened in Calabar viewing centre would have been a child’s play. “This is because at the time the incident occurred yesterday, the place was seriously built up. “This is why we keep asking people not to build within 50 meters precinct of high tension lines. “This is exactly what we are trying to avert when we say that, but people don’t understand the danger inherent in building under high tension lines,’’ he said. According to him, the incident has affected power supply to parts of Lagos. Adewunmi, however, said that work had commenced to replace the detached conductor with a new one and to restore power supply to the affected areas.